Campbells Vegetable Beef Soup 1953 Ad. 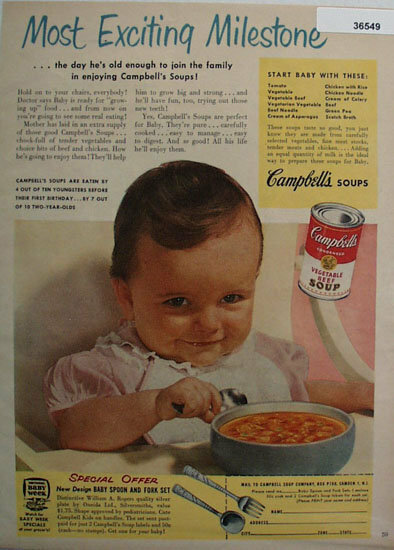 This color March, 1953 ad states Most exciting Milestone, the day he is old enough to join the family in enjoying Campbells Soups. Picture shows baby with spoon in hand looking at bowl of Vegetable Beef Soup. Magazine tear sheet picture is taken through plastic and may show wrinkles or crookedness that is not in the ad. This Original magazine tear sheet measures 8 inches wide by 11 inches tall. Items Similar To "Campbells Vegetable Beef Soup 1953 Ad"